Mr. Anubis is a greedy collector of other people's treasure, and he has his sights set on the most precious shrine in Mumpkin Patch, Founder's Fountain! But, if he wants the sacred statue that grants wishes, he's going to have to get by the Mumpkin kids first. 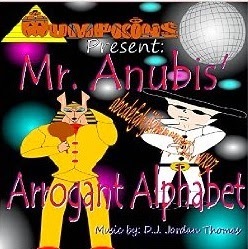 Mr. Anubis' Arrogant Alphabet is fun and adventure from A to Z!